Stephen Ruiz/Contributing Photographer Students and faculty gather at the Chabad Center for Jewish Student Life on Thursday evening to celebrate their 30th anniversary. While enjoying refreshments, attendees reminisced with photographs showing the Center’s accomplishments throughout the years. The Chabad Center celebrated its 30 year anniversary as a central part of the Jewish community in Binghamton. Over 250 Binghamton University students, faculty and Binghamton residents gathered on Thursday to celebrate Chabad’s accomplishments and impact on the University. Chabad is a part of a worldwide network of Jewish centers called Chabad Lubavitch. It is a Jewish community center located right outside of campus where students, both Jewish and non-Jewish, can attend Shabbat services, dinners and other religious and recreational activities. Rivkah Sloanim, the education director at Chabad and an organizer of the event, said that she and her husband Rabbi Aaron Sloanim came to BU 30 years ago because there was a need among Jewish students for a community center that had a full-time professional staff. They founded the Chabad Center at BU in 1985. 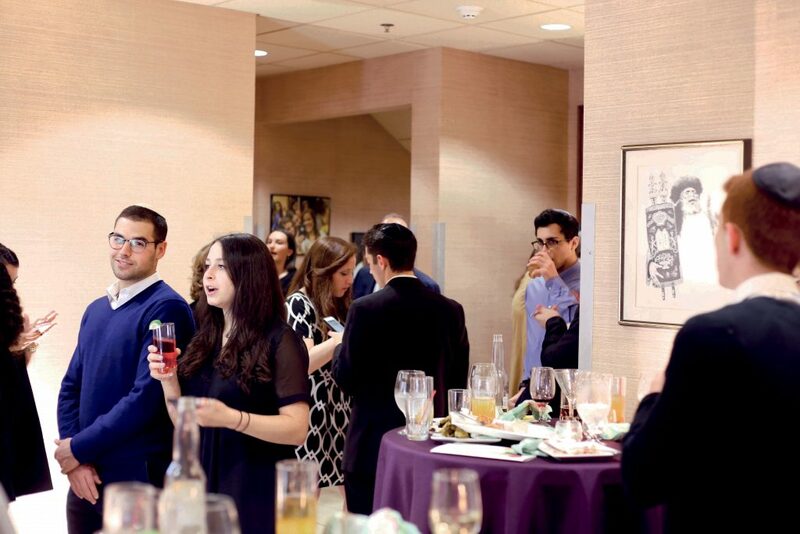 Guests gathered at Chabad for a cocktail hour and enjoyed food and drinks while looking at a timeline of photos displaying some of Chabad’s accomplishments and contributions to the University. These included various religious events held throughout the year, the weekly Shabbat services and social programming like the Chabad Café. Attendees could also write a letter on a Torah scroll in honor of a loved one. This ceremonial action is considered an important honor because of the importance and long lasting nature of the Torah scroll. Zachary Alexander, the treasurer of the student executive board at Chabad and a junior majoring in accounting, helped organize the event and said it is important to celebrate all that Rabbi Slonim and his wife have done for BU’s students. After the cocktail hour, guests sat down to listen to a lineup of speakers from the University and Chabad communities. Brian Rose, the vice president of the division of student affairs, praised Chabad for its impact of the development of BU students. Deborah Tirsun, a senior majoring in integrative neuroscience, spoke at the event on behalf of students involved in Chabad. She said that Chabad is a place where students can find support and a sense of community. Rabbi Levi Slonim, the director of programming and development at Chabad, said that while it is important to reflect on past accomplishments, it is also necessary to look forward to future ones.